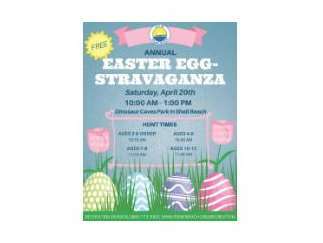 This free event will include games, bounce houses, crafts, food vendors, visits with the Easter Bunny, and more. There will also be a magician performing at 10:30 a.m. and noon in the Rotary Amphitheater at the park. Participants are asked to bring their own basket or bag to collect their eggs and goodies. To ensure the safety of all participants, there are different egg hunts for different age groups.